We’re just about to start a bathroom remodel, and I’ve spent a lot of time looking at bathrooms on Pinterest. I’ve also spent a lot of time looking at tile in Lowe’s. Countertops too. And in the toilet aisle at Home Depot (I now know way more than I want to about toilet flushing technology). Today, I’m sharing my list of best and worst bathroom remodel ideas. Unlike a designer bathroom’s pristine picture, the modern family’s bathroom is filled with stuff. You can never have enough storage in a bathroom, and a remodel is the perfect time to add some. 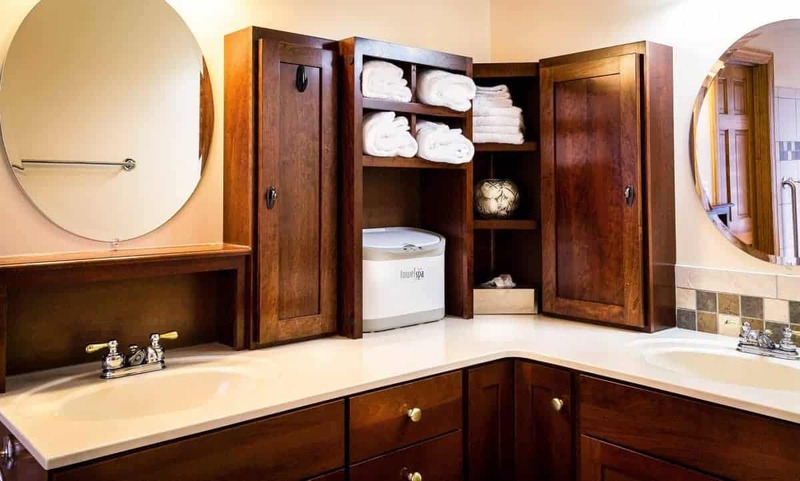 A vanity cabinet with lots of drawers, a full height linen cabinet, or a countertop vanity tower, like the one below, will go a long way towards wrangling all that stuff. Be sure to consider your storage needs as you plan your bathroom remodel. Most shower heads are located about 80″ off the floor. Depending on your height, you might want to move the shower head higher while you have the walls open. Also consider the depth of your shower head – some of the rain shower heads are quite tall and can effect the height of the water coming out. If you don’t have a lot of height, look into a rain shower that is fed through the ceiling, or a spray shower head that is on a slide bar so you can adjust the height. A bathroom remodel might be the perfect time to add some handicap accessibility features, or at least install some structural support for the future. If the wall framing is exposed, consider adding additional framing to support future grab bars near the toilet and shower. Adding a handheld shower head, a seat inside the shower, and a zero threshold entrance to the shower are a few good ideas. Choose a comfort height toilet with a seat height of at least 17″ to make it accessible. This stylish bathroom has several accessibility features. A bathroom remodel is the perfect time to replace an inadequate exhaust fan or put one in if it’s not already there. Be sure to buy the right size fan (1 cfm for every square foot of the bathroom is the rule of thumb). And, from personal experience, make sure that who ever installs the fan actually vents it to the outside and not just into your attic, and that the vent is insulated. It’s not pretty when your contractor doesn’t do it right. We just installed this Panasonic 110 CFM Fan/Light Combination in our master bathroom and are very happy with it. It is easy to install, quiet, and very effective at getting rid of steam. What could be more luxurious than a heated bathroom floor on a cold winter day? This Schluter DITRA-HEAT system would be perfect under a new ceramic, porcelain or stone tile floor. If you will be replacing the bathroom flooring, consider adding underfloor heat. Be sure to check that the finished floor height of your bathroom will be the same as the finished floor height outside the bathroom (or at least less than a 3/8″ difference to eliminate a trip hazard). 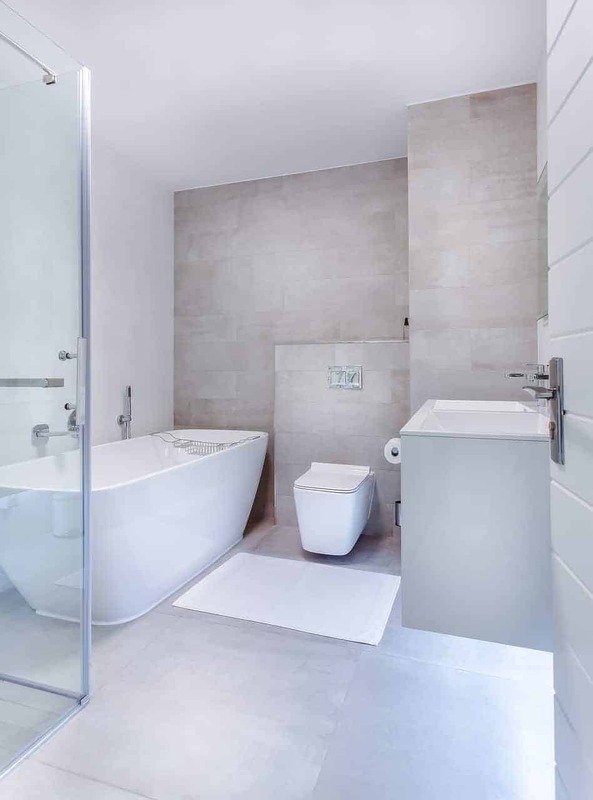 Before you begin to remodel your bathroom, study the layout of the fixtures, the clearances around those fixtures and how the bathroom functions. What works and what doesn’t? Do you hate the fact that the toilet faces the door? 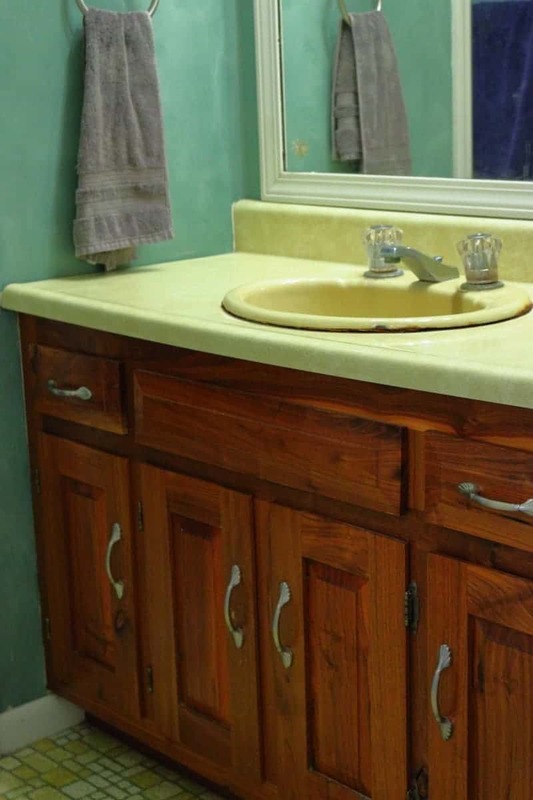 Does the vanity cabinet slam into the toilet bowl? Do you have three kids trying to get ready for school at the same time in one inefficient bathroom? Now is the time to address those problems and find solutions, especially if you are gutting the entire bath. Don’t keep your bathroom layout and settle for making a pretty, but poorly functioning bathroom. It will probably cost more, but you’ll be happy that you did it. The problem with trendy bathroom designs is that trends change. Today’s “hot” look is tomorrow’s design joke. Just look at my very trendy 1970’s bathroom. Need I say more? But, if you really love a certain look and are the type of person who doesn’t change your tastes every 5 years, then go for it. Just remember, you’ve been warned. Or, consider using accessories, which are much easier and cheaper to replace, to get that hot look you want. I love, love, love tile. I could spend hours in the tile section. So, why is tile on my worst bathroom remodel idea list? I’ve noticed a recent trend of using tile not only for the shower, but on all of the walls in the bath and the floor. Although it does give a sleek and cohesive look to the bathroom, it does have some drawbacks. All that tile can be really cold – both physically and perception-wise – which isn’t a good feeling when you’re naked and wet. More importantly, all those hard surfaces will bounce sound around like a rubber ball, and you definitely don’t want this room to be an “echo chamber”. Anyway, I have a similar feeling about the idea of a beverage center in the bathroom: someone must think it’s a good idea and somehow necessary, but I don’t get it. In case you haven’t seen it, a beverage center is essentially a minibar in your bathroom: small refrigerator with drinks, a coffeemaker, glasses, mugs, etc. How difficult is it to walk all the way to the kitchen to get your drink? What is that, like 30-50 steps? Just go get your drinks and leave the fridge out of the bathroom. Just like tile, I do love wallpaper. I even have a couple of wallpapered rooms that I have no intention of changing. I also love the new style of big, bold patterns, but not on every single wall in the bathroom – it’s too much. And, I can guarantee you, that in 20 years it’s going to look sooooo dated and you’ll wonder what you were smoking when you picked it out. So, there’s my list of best and worst bathroom remodel ideas. I’d love to hear from you – what do you love or hate? If you’re planning a bathroom remodel or even just starting to think about one, be sure to check out our Bathroom Remodel Checklist – Free Printable Download. Thanks for sharing such a fantastic trends.I really liked those tips which can change the look of the bathroom even it is small .I am glad that I came across your article.Once in a year or so you should renovate your house specially bathroom .I loved all your tips .Keep sharing latest tips.. Thanks for visiting and kind words!